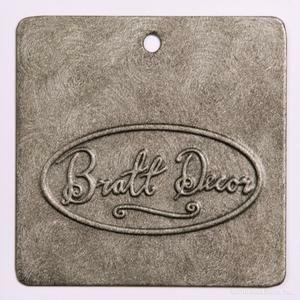 The distressed white finish is feels wonderfully worn and familiar in its elegance. Inspired by antique french wrought iron cribs, this gorgeous heirloom is timelessness and elegance made real. For even more value add the optional toddler kit conversion, and continue the life of this fantastic heirloom into the toddler years. All of our cribs are designed to the highest safety standards and meet or exceed those set by the U.S. Consumer Product Safety Commission and American Society for Testing and Materials. Each crib is tested by independent laboratories for compliance with US crib regulations. 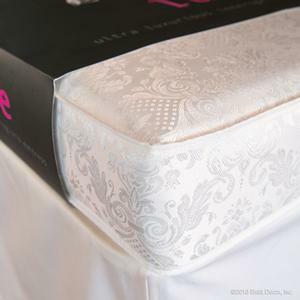 show more >>> The distressed white finish is feels wonderfully worn and familiar in its elegance. 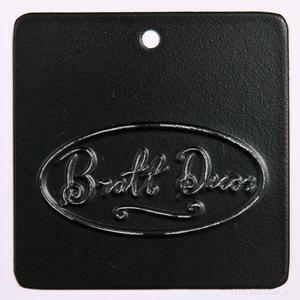 Inspired by antique french wrought iron cribs, this gorgeous heirloom is timelessness and elegance made real. For even more value add the optional toddler kit conversion, and continue the life of this fantastic heirloom into the toddler years. All of our cribs are designed to the highest safety standards and meet or exceed those set by the U.S. Consumer Product Safety Commission and American Society for Testing and Materials. Each crib is tested by independent laboratories for compliance with US crib regulations. 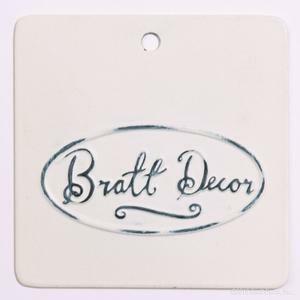 Bratt Decor casablanca crib distressed white The distressed white finish is feels wonderfully worn and familiar in its elegance. 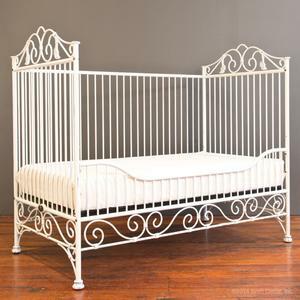 Inspired by antique french wrought iron cribs, this gorgeous heirloom is timelessness and elegance made real. For even more value add the optional toddler kit conversion, and continue the life of this fantastic heirloom into the toddler years. All of our cribs are designed to the highest safety standards and meet or exceed those set by the U.S. Consumer Product Safety Commission and American Society for Testing and Materials. Each crib is tested by independent laboratories for compliance with US crib regulations. Distance between pickets: less than 2.25"
Skirt length - Top mattress position: 20.5"
Skirt length - Middle mattress position: 16.5"
special features : This crib converts to a toddler daybed, sold separate. Carton 1: 56.25" x 36.5" x 6.5"
This is truly the most beautiful crib ever. It’s an elegant piece for an elegant nursery. With such great quality, I’m sure this crib will remain in our family for a long time. I get such rave reviews from everyone who sees my granddaughters nursery. Thank you so much. Beautiful crib, well built, unique. One downside is the crib skirt situation, it's impossible to find one that will fit floor length when the bed is on the highest infant setting. Other than that we love it! Absolutely love our crib. 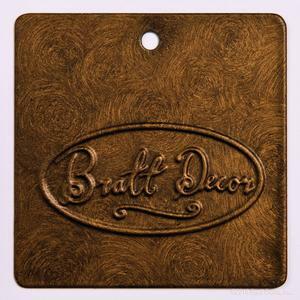 It was out of stock when we first saw it, but Bratt decor made sure we got it! It shipped in a timely manner (updated us each time) & it was easy to put together. Looks even better in person & very sturdy! We can't wait for our little one to get here & sleep in it!! 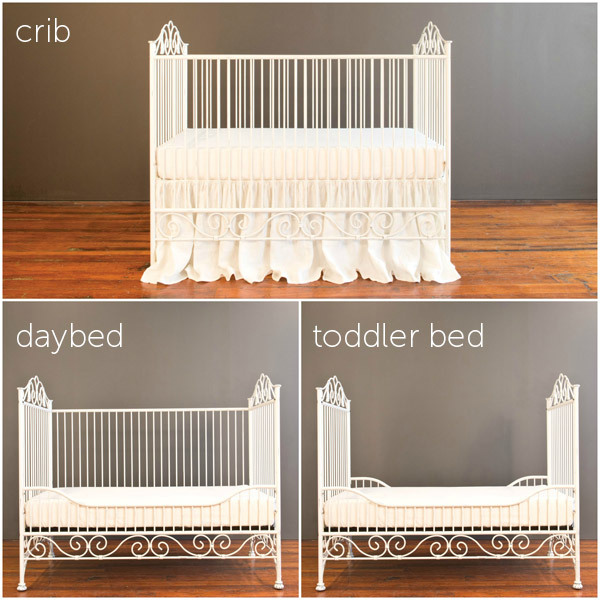 I fell in love with this crib the moment I saw it on the Bratt Decor site! I was a bit hesitant at first ordering something so expensive and the most important piece of the nursery online(especially the mattress as well) without seeing it in person first. But I am glad I did. I got it shipped right to my door and put it together very easily except when we got it a rail on it was bent I'm guessing from it being shipped and thrown around but I snapped some photos and sent them to the store and got a quick response the next morning regarding my issue and they sent me a whole new bed no extra charge just a few days later! I am very happy with my beautiful crib and the customer service I have recieved making sure I was completely happy with my purchase! Thank you!